Currently we have the windows applications broken. We are looking into it. Message 49926 - Posted: 17 Jul 2018 | 13:11:15 UTC - in response to Message 49925. Thanks, but all the GPU work has been cancelled for Linux also. Maybe you could add some back? Message 49929 - Posted: 17 Jul 2018 | 15:24:14 UTC - in response to Message 49926. Message 49930 - Posted: 17 Jul 2018 | 15:28:29 UTC - in response to Message 49929. We are trying to create a new app for Windows, but it might take few days. PS: can you post here some of the WU failed for Windows so that I can easily find the error message? Message 49931 - Posted: 17 Jul 2018 | 15:28:30 UTC - in response to Message 49929. Message 49932 - Posted: 17 Jul 2018 | 16:08:24 UTC - in response to Message 49931. Error message is always the same..
take some of my recent ones. We had the same error number (I searched for 0xffffffd4) and the same symptoms - every task failing on Windows machines, for one of the Windows apps, at the same time - on 14/15 April 2017. The conclusion reached in all WUs downloaded recently produce "computation error" right away (that's last years thread, not the similarly named thread this week) was that the licence for one component included in the app had expired. I think if all UTs generate the same error, it should be pretty simple. Message 49937 - Posted: 17 Jul 2018 | 22:15:15 UTC - in response to Message 49926. This is still the case. Now everyone is doing nothing. I just got 243000 credits for a GPU task on my main Linux box.It and the the Linux laptop are running QC tasks. Message 49974 - Posted: 20 Jul 2018 | 23:23:30 UTC - in response to Message 49973. Just caught myself a couple of those on my mine canary - the one which will tell me when good work starts to flow again. <rboinc/> is meaningless in that context and shouldn't be there. Message 49976 - Posted: 21 Jul 2018 | 3:17:32 UTC - in response to Message 49937. A volunteer effort. doubtless "Measure twice cut once" at this time. some new windows patch. ?? Message 49978 - Posted: 21 Jul 2018 | 7:19:00 UTC - in response to Message 49973.
this seems to explain why on the Server Status Page the tasks show error rates of 81% and higher. Message 49985 - Posted: 21 Jul 2018 | 19:34:54 UTC - in response to Message 49925. I had been running the Windows App on my fastest system successfully after the 14th July license problems (which occur annually but seem to take you by surprise every time) by turning my system time back. However, now you seem to have deprecated it and I get nothing. I am continually disappointed by the way this project is run. Message 49986 - Posted: 21 Jul 2018 | 22:36:26 UTC - in response to Message 49985. Message 49987 - Posted: 21 Jul 2018 | 23:30:01 UTC - in response to Message 49986. Yes, sorry that I didn't. However, the problem is a recurring one and I thought everyone knew from the last time it happened. If your running other projects other than GPUGrid, I would strongly recommend that you don't set your clock back, you could get validation errors or WU's canceled because of deadline over-run. Message 49990 - Posted: 22 Jul 2018 | 7:41:37 UTC - in response to Message 49987. Message 49995 - Posted: 22 Jul 2018 | 20:51:27 UTC - in response to Message 49994. Holidays, weekends, too few people. Message 49996 - Posted: 22 Jul 2018 | 21:43:06 UTC - in response to Message 49995. Oh, c'mon. We know that there are too few people on workdays too. Message 49997 - Posted: 23 Jul 2018 | 8:34:48 UTC - in response to Message 49996. Maybe just too few people interested. They by their own admission have few people who understand BOINC, the very platform that gives them 2.5 Pflops/sec of free computing power. I think if someone donated that much computing power to me at no cost I would have made sure I had people that understood BOINC on hand and paid attention to very simple issues like licensing. But apparently it's not as important as they keep saying or they would look after the resource much better than they do. Message 49998 - Posted: 23 Jul 2018 | 8:40:32 UTC - in response to Message 49997. As far as I know a new app was uploaded but still not working. Licensing is not related to BOINC. The problem with BOINC is that it runs the apps in an almost opaque environment, so when things go wrong there is no useful indication on the direction to take to a speedy fix. Message 49999 - Posted: 23 Jul 2018 | 8:55:00 UTC - in response to Message 49998. Licensing is not related to BOINC. I didn't say it was but it is related to your project and App. Message 50000 - Posted: 23 Jul 2018 | 10:02:08 UTC - in response to Message 49999.
for some reason your host 171874 is the only one where the app is still working. Message 50001 - Posted: 23 Jul 2018 | 10:27:32 UTC - in response to Message 50000. I turned the system clock back to before the time the license expired which allowed the Windows App to work but then someone deprecated the App thus I couldn't do that any longer. Message 50002 - Posted: 23 Jul 2018 | 10:39:31 UTC - in response to Message 50001.
hm, how did you know in advance ? Message 50003 - Posted: 23 Jul 2018 | 10:42:31 UTC - in response to Message 49998.
did you ever consider to come up with your own application, indipendent of BOINC (similar to what FAH is doing)? Message 50004 - Posted: 23 Jul 2018 | 11:36:00 UTC - in response to Message 50003. Yes but it's a huge development effort. Admittedly once done you have full control but we don't have the resources to do this. Message 50005 - Posted: 23 Jul 2018 | 12:05:33 UTC - in response to Message 50004. This may be incredibly ignorant of me but why not release the old windows app with a different version number and renewed license. Message 50008 - Posted: 23 Jul 2018 | 12:56:12 UTC - in response to Message 49985. I had been running the Windows App on my fastest system successfully after the 14th July license problems (which occur annually but seem to take you by surprise every time) by turning my system time back. I would like to add that setting of the system clock back in time will break Windows Update and the update automation of many antivirus products, so this is highly not recommended thus could serve only as a temporary measure and do it only at your own risk. I will be switching all of my crunching systems to Linux as I don't see this will be fixed anytime soon. I will be a patient donator, and my systems will gladly do work when the admins have had enough time to fix the problems. Some of you guys get upset too easily, and your knee-jerk reactions are a bit rude. Message 50011 - Posted: 23 Jul 2018 | 14:33:58 UTC - in response to Message 50010. Well their data still needs to be processed at the end of the day, and if we wait around and don't adapt to the situation the simulations will still be sitting there waiting to be processed and we will be that much further away from a cure. Message 50014 - Posted: 23 Jul 2018 | 16:59:42 UTC - in response to Message 50011. I've swapped my GTX 1080 Ti from my main rig and installed Linux to my 3 online hosts on the last weekend. I wanted to do it anyway to get rid of WDDM. I'd like to have SWAN_SYNC in the Linux app too. Message 50020 - Posted: 23 Jul 2018 | 19:09:10 UTC - in response to Message 50014. ...I wanted to do it anyway to get rid of WDDM. Just out of interest, my question is: what slows up GPUGRID crunching more: the Windows WDDM or the missing Swan_sync with Linux? Message 50021 - Posted: 23 Jul 2018 | 19:29:45 UTC - in response to Message 49998. Message 50022 - Posted: 23 Jul 2018 | 19:32:24 UTC - in response to Message 50020. I will offer my 2 cents. There is a much bigger gain getting rid of WDDM and going to Linux. I have used Swan_sync with Windows only, but I would be surprised if you see much gain using Swan_sync with Linux, even if you can figure out how to do it. Message 50023 - Posted: 23 Jul 2018 | 19:33:24 UTC - in response to Message 50014. SWAN_SYNC is not needed. I have never had to adjust priority of CPU apps or reserve a CPU thread for GPU projects in Linux. GPU apps just take what is needed and the CPUs apps get what is left. GPU utilization is just higher in Linux w/o any settings and CPU util is around 15-20% for GPUGrid. I am currently running FAH on a GPU and 4 BOINC CPU tasks on one PC. Another PC is running GPUGrid and 16 CPU tasks. Message 50024 - Posted: 23 Jul 2018 | 20:11:12 UTC - in response to Message 50023. Well, the stats pages do not support your argument. You'll find that my GTX 980 Ti beats, or gets very close to GTX 1080 Tis, and GTX TITAN X (Pascal) GPUs running under Linux. That's because it was running under Windows XP (without WDDM) and with SWAN_SYNC ON. True, but it could be even higher with SWAN_SYNC ON. Well, that's irrelevant for me, as I don't run CPU tasks at all, as I want to optimize my PC for GPUGrid. All in all: I'd like to have the option under Linux to assign a full CPU thread / core to my GPUGrid tasks with SWAN_SYNC on, as it will make tasks crunch faster on Linux too. Message 50026 - Posted: 24 Jul 2018 | 2:47:09 UTC - in response to Message 50024. I never once mentioned overall performance and was not referencing anything about performance but GPU utilization. You failed to see that even with many things running in different situations that the GPU is fully utilized in Linux w/o wasting a CPU thread. Message 50028 - Posted: 24 Jul 2018 | 8:42:02 UTC - in response to Message 50026. You failed to see that a GTX 1080 Ti can't be fully utilized under Linux if a fully utilized GTX 980 Ti (previous generation) can achieve 98.66% of its performance. I do not consider feeding a GPU with a full CPU thread as waste, because I know that otherwise I'm wasting 5-15% performance of my GPUs. The lack of SWAN_SYNC in the Linux client forces me to waste that much GPU performance. I want to have this choice, while you don't. Therefore you don't need SWAN_SYNC, while I (and many others) do. So there's no point for us to go on with this argument. Also, this argument is off topic here. This is my last post in this thread about this topic. The GPU is clocked up to its maximum clock frequency when computing, let's say 1999mhz for Pascal. It takes upwards of 1.0620 volts to maintain this frequency. If you aren't feeding this frequency with data at an acceptable rate, you are technically wasting power because most of the cycles are going to waste. The GPU only draws slightly more current when loading the GPU at the same voltage, thus making the whole process more efficient. I too, would like SWAN_SYNC on Linux as an OPTION so we can choose whether or not we can use it. But if this means development work for the researchers then I definitely think fixing the GPU windows app is the main priority and making a windows CPU app comes before this new option. Message 50030 - Posted: 24 Jul 2018 | 13:26:42 UTC - in response to Message 50011. Is our crunching work directly used for a cure / medicine, or is it just published as theoretically simulated / calculated results? Message 50031 - Posted: 24 Jul 2018 | 13:27:51 UTC - in response to Message 50021. I've been told that BOINC provides tons of tools for figuring where and why failures happen. And that link seems very useful. Message 50032 - Posted: 24 Jul 2018 | 14:00:57 UTC - in response to Message 50030. Keep in mind, both are useful. Other researchers can use simulated protein folding to calculate what to do for their drug. Message 50033 - Posted: 24 Jul 2018 | 14:30:31 UTC - in response to Message 50030. The short answer is no to the first part and yes to the second. One of its purposes is as a teaching tool for PHD students. If they discovered a method or an insight that was commercially valuable and helped the biomedical industry they would patent it and sell or license it. In the meantime they produce scientific papers with methods or insights that gets the student their PHD or not. The best you can hope for as far as a cure is concerned is that the simulations may point the way for someone else to explore or that one of their successful PHD students goes on in later years to make a difference such as finding a real cure for cancer or other major disease. Message 50034 - Posted: 24 Jul 2018 | 15:14:34 UTC - in response to Message 50033. Well, my answer to the first part would be a little more optimistic, say "not...yet", as it is all about computing power. Imagine, modern high end GPUs are now as powerful as super-computers back in the year 2000. Still too slow to handle big proteins, but there is some progress. The upcoming Turing Generation seems to be again 20-40% faster than its predecessor Pascal and this will continue until tunnel effects obstruct further shrinks. Having said this, there are some new technologies in development to reduce that effects. And of course Quantum Computers will be in the ascendant in a couple of years, as big companies like IBM, Microsoft or Google put a lot of capital in it (but for reasons other than drug science). Lets keep on crunching and see where this road goes to. One is for sure, computers science and medicine will be entirely different in 10 years from now. It appears to use a 4 qubits quantum computer, probably provided by Google since one of the authors is a Goggle person. Eh, I would not go as far as to say it's mostly a tool for PhD students as BettingSlip mentioned (although I'm sure he didn't mean it in a negative way). The theoretical research being published is used to progress science and the specific field, it's not like this work ends up as fluff for a PhD thesis. Simulations we have done have provided interesting insights in disordered proteins, protein-protein associations and more which can be used by the industry as BettingSlip mentioned. Currently we are also trying to get more into drug design in our lab so you might see interesting more direct applications in the next few years. But yes, the connection between theoretical and direct application is often hard to see or appreciate, which is what leads to lack of funding for basic research which is arguably inefficient in the long term. Message 50040 - Posted: 25 Jul 2018 | 8:54:03 UTC - in response to Message 50038. Good clarification - then it's just the way I already assumed it to be. In the realm of non-profit research, it is entirely collaborative. Even if what someone is researching doesn't seem like it would make a difference, what they discovered could be the holy grail for another researcher team. You see this time and time again throughout our scientific history. Message 50047 - Posted: 25 Jul 2018 | 12:01:11 UTC - in response to Message 50045.
any idea when an app for Windows will be available? Further, will there be a version for XP as well? Message 50048 - Posted: 25 Jul 2018 | 12:42:25 UTC - in response to Message 50047. Message 50049 - Posted: 25 Jul 2018 | 12:47:08 UTC - in response to Message 50045. Message 50050 - Posted: 25 Jul 2018 | 13:23:06 UTC - in response to Message 50049. As exciting as that prospect might sound to all contributors to public distributed computing projects such as this one it will never happen. There is always the inconvenient fact that few (if not all) scientists have little confidence in public distributed computing. Message 50051 - Posted: 25 Jul 2018 | 13:25:55 UTC - in response to Message 50048. I know this thread and it's content. Still I don't stop hoping that they may have changed their mind and provide once more an app for XP. Message 50052 - Posted: 25 Jul 2018 | 13:34:29 UTC - in response to Message 50051. The only reply I can give to someone who asks a question that they already have read the official answer to is "dream on"
Message 50053 - Posted: 25 Jul 2018 | 14:32:16 UTC - in response to Message 50050. But confidence in what? It may not be used for developing commercial drugs, but for basic science the results could be quite useful. That really depends on how relevant the questions are that the researchers are asking. The real limitation is that in the academic world, they may not know what issues to investigate that are most relevant. A tie-in between the university and industry (as in an advisory board) might help that. Well guys... It doesn't work that way. Science as a "whole thing" is so complex and unpredictable that we can't even assume what is going to be important and what is not. One hundred years ago Maria Sklodowska Curie found out that some strange piece of scrap is destroying photographic film. Who cares, right? There was war, people were hungry and have others "big and now" problems. But she studied it and now we have radiotherapy, MRI, gamma knife and many others things. Who could ever know? Message 50057 - Posted: 25 Jul 2018 | 18:32:31 UTC - in response to Message 50056. We also had nuclear bombs, nuclear fission reactors and, hopefully, fusion reactors. Science can make both good and bad fruits. Message 50059 - Posted: 25 Jul 2018 | 18:59:20 UTC - in response to Message 50058. Message 50060 - Posted: 25 Jul 2018 | 19:05:51 UTC - in response to Message 50059. Are we? I read the Bulletin of the Atomic Scientists. USA have 4850 nuclear warheads, 160 of which are stored in Italy, 20 at an air base 200 km from my home. Russia has the same amount, and I don't mention UK,France,China, India,Pakistan and Israel. Message 50061 - Posted: 25 Jul 2018 | 19:08:41 UTC - in response to Message 50060. We can withdraw the U.S. ones from Europe. Then the Russians will be free to move in theirs. Message 50062 - Posted: 25 Jul 2018 | 19:20:03 UTC - in response to Message 50061. I don't think UK and France would allow it. They have nuclear warheads too. Message 50064 - Posted: 25 Jul 2018 | 19:53:39 UTC - in response to Message 50063. Why not keep it totally on topic -- shutup and wait for an announcement that the damn thing is fixed!! Message 50066 - Posted: 25 Jul 2018 | 20:55:01 UTC - in response to Message 50064. That was a bit unnecessarily rude. I also hope that they can fix it. any vague idea when the Windows app will be available? Message 50069 - Posted: 26 Jul 2018 | 17:40:12 UTC - in response to Message 50068. We are working round the clock to restore it... sorry for the delay. It's not easy. By the way the cuda65 app should be ok, although there are no WUs. We know you're doing your best, be strong and good luck! Don't listen to the haters. Message 50072 - Posted: 26 Jul 2018 | 22:15:44 UTC - in response to Message 50069. It works on windows xp. Message 50073 - Posted: 27 Jul 2018 | 5:07:18 UTC - in response to Message 50072. It should work as before. I sent some test WUs. Work to come. Many thanks for the efforts put in by everybody at GPUGRID ! Message 50076 - Posted: 27 Jul 2018 | 8:06:57 UTC - in response to Message 50074. Message 50078 - Posted: 27 Jul 2018 | 9:12:09 UTC - in response to Message 50076. What did you guys have to do to fix the application? Message 50081 - Posted: 27 Jul 2018 | 11:05:31 UTC - in response to Message 50074. Message 50086 - Posted: 27 Jul 2018 | 12:56:27 UTC - in response to Message 50085. I think something (either failures, or likely recent short tasks) made some machine over-optimistic about its own fp-ops. As a consequence, BOINC estimated that tasks could be run in a few hours, which is untrue. Message 50087 - Posted: 27 Jul 2018 | 15:01:51 UTC - in response to Message 50086. Can't be true, my machine have only run GpuGrid long WU's and have the same problem. Anyway GpuGrid was my last BOINC project and I have decided to hang up my BOINC boots. The satisfaction of contributing has just left me. Message 50088 - Posted: 27 Jul 2018 | 15:04:54 UTC - in response to Message 50086. I guess I gathered what you mean, but this machine has not run any BOINC tasks in the meantime. So there should not be any (too short) runtime values somewhere deep in BOINC. However, I increased the value by the factor 10, guess this should be sufficient. Yeah! Two WUs downloaded. I love the sound of my GPU fans spinning up. Message 50090 - Posted: 27 Jul 2018 | 15:20:38 UTC - in response to Message 50087. Anyway GpuGrid was my last BOINC project and I have decided to hang up my BOINC boots.The satisfaction of contributing has just left me. Message 50091 - Posted: 27 Jul 2018 | 15:30:17 UTC - in response to Message 50088. Have you also tried selecting the "re-run benchmarks" (or something) menu option? Message 50092 - Posted: 27 Jul 2018 | 15:36:20 UTC - in response to Message 50088. You are right. Don't know what so say except that it's frustrating on this side too. There is an excess of hidden state and undocumented checks. My hope is that it will resolve by itself at some point (maybe resetting the project). Message 50094 - Posted: 27 Jul 2018 | 16:01:31 UTC - in response to Message 50092. Do you require help from some of the BOINC devs? They're pretty responsive on the BOINC Projects email group, and if there is some sort of transparency problem, they'd want to hear about it. Message 50095 - Posted: 27 Jul 2018 | 17:09:09 UTC - in response to Message 50094.
for the new v9.22 app by a factor of at least 10 and perhaps 100. You may have to generate new workunits with the uprated bound. Runtime estimates will almost certainly appear to users as vastly inflated in the initial stages, but hang in there - they will become 'accurate' (-ish) after the first 11 completed tasks. More when I can eyeball it. Thinking about it in the shower, that's the wrong way round - apps faster than expected shouldn't cause a problem. Jacob, while I'm drinking/eating/drinking/sleeping/travelling/sleeping, can you pull the guts out of the <app_version> for 9.22 and a matching WU&task - just the BOINC metadata, not the file references - and post them for me to look at before I get home. Even better if you could subsequently run it and point me to the outcome online. I'm wondering if the project might have slipped half-a-dozen orders of magnitude in <rsc_fpops_est>. Now I've got a bus to catch. Message 50099 - Posted: 27 Jul 2018 | 18:13:21 UTC - in response to Message 50098. No, I just started a 4 day vacation, sorry. The interesting thing is that this problem does NOT come up in the cuda65 app (for Windows XP), but only in the cuda80 app (for Windows10). I've downloaded 2 Long run tasks on my Windows 10 PC and one is running. It seems to run OK but,according to the Task manager, it seems to use both the CPU and GPU (GTX 1050 Ti), very scarcely compared to SETI@home GPU tasks on the same host. What I noticed so far is that with the Cuda_80 app the GPU load now is about 75%, whereas for the same type of task, crunched on WinXP with the Cuda_65 app, the GPU load is between 96% and 98% (like is was with the former Cuda_80 app, too). This somehow seems interesting, if not to say strange. Just had 2 cuda 8 GPU work unit error out due to the time exceeded on my 1080TIs on Win 7. Reset the project and will see if that fixes the problem. I have already reset the project and re-run the benchmarks, it apparently didnt change anything. Shall we power down our machines again? Message 50105 - Posted: 27 Jul 2018 | 22:27:22 UTC - in response to Message 50098. The outcome will be here. I think it will succeed. the rsc_fpops_bound was only 250 000e12 before. Message 50106 - Posted: 27 Jul 2018 | 23:03:58 UTC - in response to Message 50105. That's good start - thanks. The errors on that machine earlier today were after ~5,670 seconds - maybe they took my advice while I was out, and upped it by three orders of magnitude? OK, that's as far as I can go here. I need to watch it on one of my own machines. But the problem seems to be that absurd 43 teraflop speed rating. The only cause of that I can think of might be if they put through some shortened test units WITHOUT CHANGING <rsc_fpops_est>. Anybody see anything like that? Message 50107 - Posted: 27 Jul 2018 | 23:07:30 UTC - in response to Message 50106. That is my conclusion too (see the end of my previous post). Message 50108 - Posted: 27 Jul 2018 | 23:36:54 UTC - in response to Message 50107. How much longer will they need to let tasks run before they get enough information to fix the problem? It looks like one more order of magnitude for run time should at least give them more information. Also, users might help by mention whether their tasks were able to write a checkpoint, and then continue after this. Message 50110 - Posted: 28 Jul 2018 | 0:17:33 UTC - in response to Message 50106. It's currently running on my Windows 10 w/ 1080ti. 86.4 % complete in 14:31 (m:s). It's an ADRIA job. So the jobs are running much faster than they did before. I leave that up to your interpretation. That job took 16:30 to complete about the same as the job that ran before it. Now starting on job 3. This one's a PABLO and took 2:01 to reach 1%. 2% done and estimate is 2:07:20 (and falling) to completion. Message 50111 - Posted: 28 Jul 2018 | 0:20:43 UTC - in response to Message 50109. The workunits generated with the improper <rsc_fpops_bound> will be around until they error out. I have two such workunits on my host, so I've manually edited the client_state.xml file to have the right <rsc_fpops_bound> value. Do we have to do this from now on, on each GPU Task? Message 50114 - Posted: 28 Jul 2018 | 1:40:04 UTC - in response to Message 50113.
exit code -80 is a Driver Issue (OpenCL Missing) as can also be C++ Runtimes issue maybe even missing. You need both the x86 (32Bit) and the x64 Bit versions. As well as unstable GPU and or CPU. This is not the same issue as "Exit status 197 (0xc5) EXIT_TIME_LIMIT_EXCEEDED"
Message 50115 - Posted: 28 Jul 2018 | 2:12:13 UTC - in response to Message 50114. SETI@home tasks complete using opencl_nvidia_SoG. Temperature using Thundermaster is 66 C.
Please start a new thread for the Simulation Unstable issue, if you must. It typically means your GPU is overclocked too much, and this project pushes it harder than other projects. If you want help determining a max stable overclock, PM me and be patient. Message 50117 - Posted: 28 Jul 2018 | 2:28:40 UTC - in response to Message 50116. MY GPU is not overclocked. I never overclock. From what I saw yesterday, somehow the system got itself into a state where it thought our machines were much faster than they really are. 'machine speed' comes from one of two places: either the aggregate returns across the whole project, or the actual behaviour of each individual computer. The speed of the individual computer takes over in the end - after 11 tasks have made it all the way through and been validated. So "11 times per computer" should be the maximum number of manual interventions required. But since they seem to have put in a workround for the faulty kill-switch, you may not have to do it that many times, or even at all. Because work is now being completed properly, the system-wide speed assessment will be correcting itself at the same time, so that machines which have been inactive while waiting for the new app may never even see the problem. But it's hard to predict when that will kick in: I may find out when I get home. As Retvari has pointed out, there will be faulty workunits circulating around the system for a while yet, and they are a problem because they waste resources for a significant length of time. Those are the ones it is most helpful to patch via the file edit: once they have been completed and validated, they won't come back to haunt us again. Message 50123 - Posted: 28 Jul 2018 | 7:57:39 UTC - in response to Message 50119. To summarize: the problem AFAIK were the test WUs, sent without changing the ops estimate. I now cancelled them all, and temporarily raised the OPS bound by 10^3. Message 50124 - Posted: 28 Jul 2018 | 8:19:33 UTC - in response to Message 50123. That sounds good. I agree with you about the cause, and the workround will let the system clean itself out with no further intervention. I think you once said that the rsc_fpops_est was fixed by the workunit generation script: it might be a good idea to start thinking about making it easier to vary that. But not this weekend - take some time off! Message 50125 - Posted: 28 Jul 2018 | 12:04:16 UTC - in response to Message 50123. I still received a task which has the lower rsc_fpops_bound value. So we should watch these workunits carefully (and fix those which have the lower rsc_fpops_bound) until they've cleared out from the scheduler. Message 50126 - Posted: 28 Jul 2018 | 13:15:15 UTC - in response to Message 50125. Unfortunately rsc ops values can't be changed once the task is created. I'm waiting that the newly created tasks make the flops estimate return to normal, and then the old tasks should work as well. Thanks Retvari Zoltan for your fix as for the most part worked for me. Could the cause of this (197 (0xc5) EXIT_TIME_LIMIT_EXCEEDED) been the new version of the Client Software 7.12.1? I noted that after the update the Client Software ran benchmarks off the bat and I do not recall older versions doing this. It was not clear to me if all the Windows GPU systems need intervention or if it will sort it out eventually. These are all at a remote location and I don't have remote access anymore. It will be a few days until I can get to them. Message 50130 - Posted: 28 Jul 2018 | 17:20:58 UTC - in response to Message 50128. I am currently closely involved in the preparation, testing, and releasing of new client versions. The new client was released well before this problem arose, and (in this respect) the new client works exactly the same as previous ones, going back several releases. We've now got a pretty clear handle on the release of GPUGrid application 9.22 as the culprit, though I will still test my own machines as I start each of them back up (which will happen after the next transfusion of coffee - only just got back home). OK, I've started the first. Got (project) flops of 461,290,595,930 - 461 gigaflops. That's still too high (this machine had 243 GF for the previous version), but it's in the right ballpark and I'll let it run. All my machines have now completed tasks without error and without manual intervention. I think we're out of the woods. Host 477287 is useful. I left that running throughout: you can see that the 'time before error' slowly increased from 17Ksec to 23Ksec as the speed estimate normalised. The task which completed successfully would have crashed after about 90Ksec, but that was more than enough. I have a slight concern about the short queue task it's working on now, which is running at a very erratic speed. But that could be the app, the task, or the machine. I'll keep an eye on it. Seems that we need to remove the settings now or Reset the Project. Tasks are saying 9 Days to complete even though they take less than 3 hours. # Could not create GPU contexts. I am glad not to be the only one. This is what I was getting. Message 50216 - Posted: 6 Aug 2018 | 15:48:07 UTC - in response to Message 50215. This message is usually the sign of too high GPU clocks and / or too high GPU temperature (Yes, 78°C could be high). 3. reduce GPU clock frequency. This error message has nothing to do with the new Windows app. Message 50217 - Posted: 6 Aug 2018 | 15:51:26 UTC - in response to Message 50211. If you did so, you should uninstall it, and reinstall without this setting. Message 50218 - Posted: 6 Aug 2018 | 16:09:24 UTC - in response to Message 50216. The same app on my SUSE Linux box with a GTX 750 Ti board runs at 62 C.
Message 50219 - Posted: 7 Aug 2018 | 9:11:52 UTC - in response to Message 50217. No ... other projects are working fine. Message 50221 - Posted: 7 Aug 2018 | 13:58:12 UTC - in response to Message 50216. The same GPU board runs SETI@home GPU tasks at 71 C, fan speed 50%, clock 1695 MHz and no error. Message 50222 - Posted: 7 Aug 2018 | 14:56:21 UTC - in response to Message 50221. That's irrelevant. 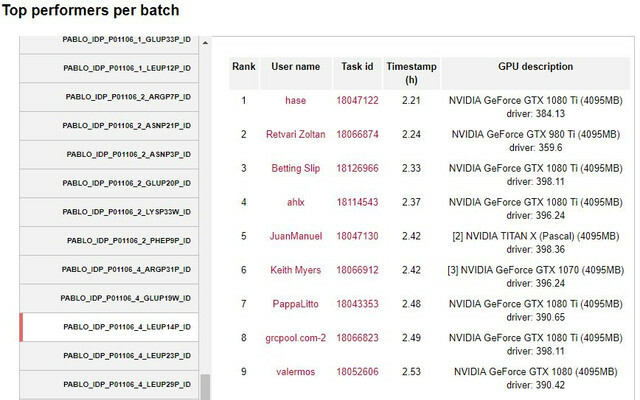 The GPUGrid app is much harder on GPUs than other apps, partly because it's based on CUDA8.0, while the other apps based on earlier CUDA versions. Not necessarily true. The Seti Linux CUDA9 app runs gpus a lot harder than the stock OpenCL application. I don't see more than 62° C. on my air cooled cards. Message 50224 - Posted: 8 Aug 2018 | 2:32:05 UTC - in response to Message 50222. Message 50225 - Posted: 8 Aug 2018 | 2:40:50 UTC - in response to Message 50224. The SoG is just the name of the app. You don't have to run the stock SoG Linux apps at Seti. Most Linux users run the CUDA8 or CUDA9 gpu apps which are about 10 times faster. Message 50227 - Posted: 8 Aug 2018 | 7:41:07 UTC - in response to Message 50226. I run what does not fail. Times are not important. I am running SETI@home on a ulefone smart watch, on a Linux box and a Windows 10 PC. Message 50229 - Posted: 8 Aug 2018 | 10:34:55 UTC - in response to Message 50227. Of course ulefone is a smart phone, not a smart watch as I wrote. It runs Android 7.1.1 and has also a GPU which SETI sees but Einstein does not. Or maybe their BOINC servers. It has eight processors and a 4 GB RAM. Message 50231 - Posted: 8 Aug 2018 | 21:05:33 UTC - in response to Message 50226. I don't see any CUDA8 or CUDA9 apps on the list of SETI@home applications. The highest CUDA version used for Linux is 6.0. Message 50232 - Posted: 8 Aug 2018 | 21:23:52 UTC - in response to Message 50231. SETI has a long history of encouraging volunteer developers to improve their stock applications. The best of the resulting applications (with high reliability and high validations rates) are accepted as new stock applications - the opencl_nvidia_SoG application mentioned earlier is one such. The cuda8 and cuda9 apps are candidates, but haven't yet reached a sufficient level of acceptance to be deployed as stock. Message 50234 - Posted: 8 Aug 2018 | 22:50:40 UTC - in response to Message 50227. I run what does not fail. Times are not important. Then it would fit the above ideas if you would lower the power target and/or the clock frequency of your GTX 1050 Ti to make it stable with the GPUGrid app, right? Message 50235 - Posted: 9 Aug 2018 | 8:51:04 UTC - in response to Message 50234. I am not a GPU expert and uses default values both on the 1050 Ti on the Windows 10 PC and 750 Ti on the Linux box. This last runs GPUGRID GPU tasks with no problem, so I leave 1050 Ti to run SETI@home tasks. hello to all the guys in a while comes the super NVIDIA GeForce GTX 1180 https://www.techpowerup.com/gpudb/3224/geforce-gtx-1180 I can not wait for me that you think of this new graphics card ? This thread is supposed to be about a license expiring, and how that broke Windows GPU applications. If your conversation isn't about "a license expiring, and how that broke Windows GPU applications", then please start a separate thread. Message 50238 - Posted: 11 Aug 2018 | 18:35:36 UTC - in response to Message 50232. I'm curious as to where the threshold is "for a sufficient level of acceptance" for the CUDA special apps. What is the target? I have less than a 2.5% ratio of Inconclusives to Valid tasks. I think the stated goal for the science apps is less than a 5% Inconclusive ratio. On my systems, I believe I have reached a "sufficient level of acceptance". I see no reason not to have the zi3v special app qualify for stock. Message 50239 - Posted: 11 Aug 2018 | 22:32:55 UTC - in response to Message 50238. It's not the performance on any one machine - yours, or anybody else's. You would have to convince Eric Korpela (and nobody else) that the overall validation rate, across all computers that might be eligible - under the rules of eligibility that you will have to supply him with - to download the app, will be acceptable within the project's standards. Which I don't know, but Eric does. My personal validation rate at this moment is 17 inconclusive from 1038 valid, with the SoG app on NVidia under Windows. Previous experience tells me that the inconclusives are usually against wingmates running 'the usual suspects' - yup, there's a v8.00 (opencl_intel_gpu_sah) x86_64-apple-darwin in there. That's why offline bench testing against known good reference results is so important - it eliminates the variability of unverified wingmates. Next applications "Long runs (8-12 hours on fastest card) v9.22 (cuda80)" don't work and will be rejected. What is up ? Message 50328 - Posted: 28 Aug 2018 | 22:05:14 UTC - in response to Message 50320.